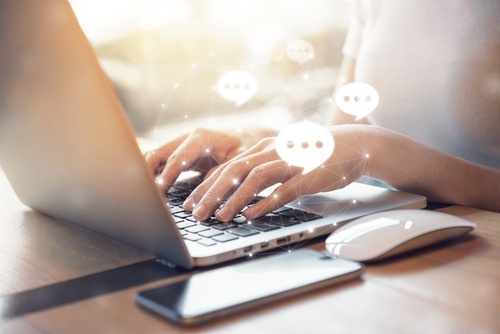 Live chat software is becoming increasingly popular, giving companies a tool to enhance their customer service, sales and marketing capabilities while giving website visitors on-the-spot information they want and need. HubSpot Messages is HubSpot’s answer to live chat software, and it comes with powerful features that outpace the average live chat tool lineup. HubSpot Messages, which is part of the HubSpot Sales Pro package, beats out other live chat software for several reasons, especially if you’re already using or considering the HubSpot platform and tools for marketing, sales and customer relationships management (CRM). The messages tool seamlessly imports the leads into your HubSpot CRM, making it a veritable lead-capturing machine. If you’re engaging with a prospect for the first time, the chat is imported as a lead. If the chat is with an existing contact, the conversation gets added to their profile so you can track their ongoing engagement. Once a chat has been assigned to someone in your marketing and sales team, that same representative can be assigned to every subsequent chat the visitor initiates on your site. That means the visitor will be greeted with a familiar rep with whom they’ve already engaged. One more plus is the option of including a link for scheduling a meeting at the top of the chat field. Visitors can instantly book a meeting right on the spot. Optimize your site: Once you’ve been using messages for a bit, you may start to see the same questions pop up again and again. The answers to such commonly asked questions can make ideal content for your site, giving you a chance to fill in information that may have been lacking. Strengthen your relationships: The messages tool gives visitors a new channel of communication, a fast and easy way to contact reps for an immediate response. Visitors can use it to share feedback, and you can even elicit that feedback by customizing the message visitors see during different parts of their journey. Close more sales: With personalized attention, easy meeting scheduling and the ability to rapidly respond to visitor inquiries, the messages tool has the overall benefit of helping you close more deals. A number of quick tips can help you get up and running with messages in no time. Find the messages dashboard: The messages dashboard is located under the Sales Tools dropdown menu of your Sales dashboard. Route the message: The last step in creating a message is choosing the team member who will receive the message, which can be adjusted based on other team members online availability. Publish: Give your message a name then hit the publish button when you’re ready to roll. Messages best practices can help you make the most of the tool. Encourage visitors to ask questions, which can kick-start a conversation. Create different messages for different pages on your site. Use messages on pricing and products pages, where they perform well to answer questions and schedule meetings from visitors with buying intent. Live chat software can give your business a boost, and choosing HubSpot Messages as that software can make the boost even bigger. With a quick setup and easy manageability, you can rapidly put the tool into action to start receiving just as rapid results.